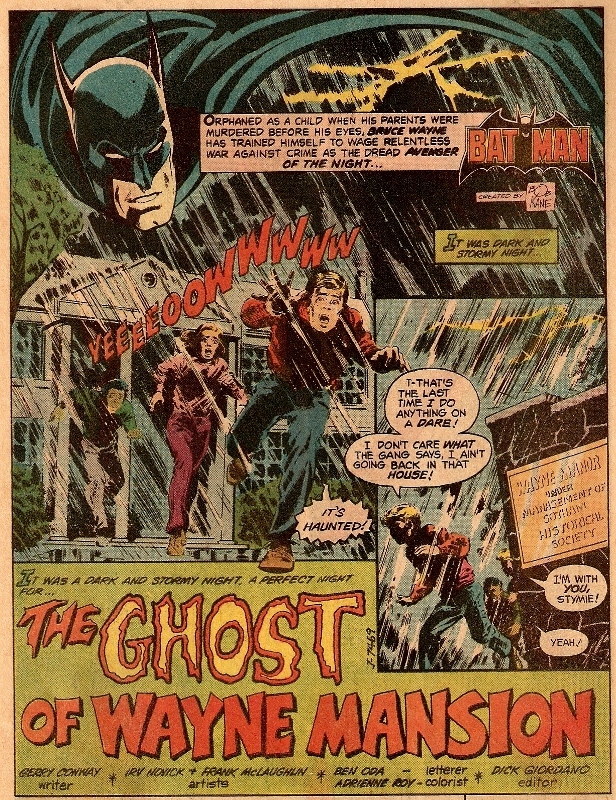 title: "The Ghost of Wayne Manor!" Three children who were dared to spend a night at the old Wayne Mansion are scared to death by what they see (or think they see). Stymie runs out of the yard and into the road, almost getting hit by a passing police officer. He promises to come back and investigate their "ghost" after he gets them all safely home. The next day, Commissioner Gordon asks Bruce Wayne for permission to search Wayne Manor because of the bizarre report. Bruce, afraid of what the police might find, doesn't give his permission. This annoys Gordon fiercely, who storms out. In a sequence that has nothing to do with Man-Bat, Boss Thorne returns to Gotham City from a stay at a mental asylum and plans to take over the "Tobacconists' Club," the power behind the power in Gotham City. That night, Batman and Alfred check a computer map of Wayne Manor and find that the grandfather clock secret entrance in the main hallway of Wayne Manor was left open. Batman heads out to close it. Meanwhile Commissioner Gordon, Dr. Thirteen, and Miss Crum of the Gotham Historical Society are meeting outside of Wayne Manor. Gordon tells them about "the ghost" who scared a crook who had broken into the Manor, as well as the report from the police officer the night before who saw things that he could not explain. 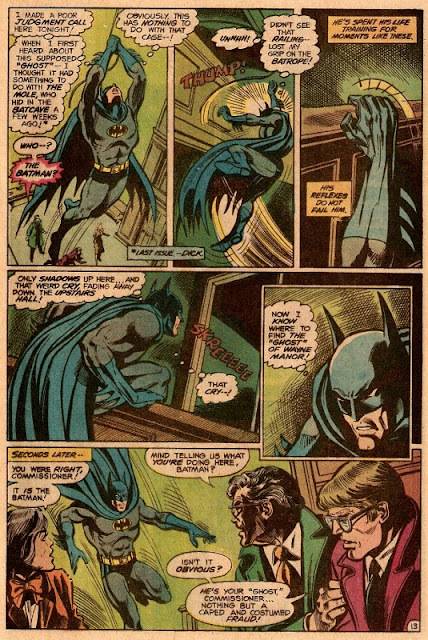 Batman overhears, and rushes to get into the house first. He knows that the well-known nay-sayer Dr. Thirteen plans to use sonic pulse gun to find space behind walls and is sure to find the entrance to the Batcave if he doesn't act fast. As Gordon, Dr. Thirteen, and Crum enter the house, Batman causes the lights to go out, then short-circuits Dr. Thirteen's equipment. The group moves around in the darkness until they hear a shriek from above, and some flying creature knocks out Dr. Thirteen. Batman follows "the ghost" and realizes who it really is. 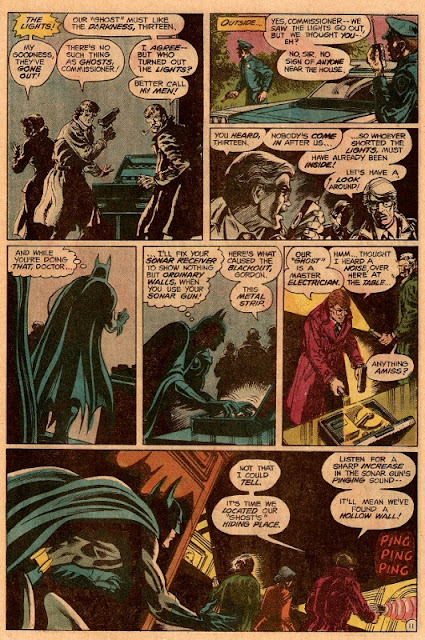 Batman returns to Gordon and asks for one hour to clear up the mystery. Reluctantly, Gordon agrees to not interfere. However, Dr. Thirteen does not agree and he sneaks back into the house. 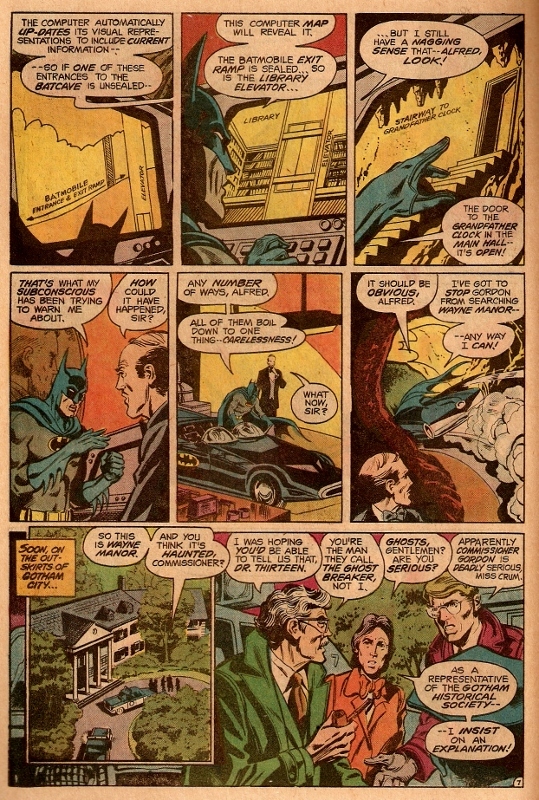 Batman goes to the old generator in the Batcave and turns on all the lights underneath the mansion, scaring Man-Bat into the open. Man-Bat and Batman spar, as Batman is confused by Kirk Langstrom's lack of control and recognition. Dr. Thirteen has re-entered Wayne Manor and his sonar gun is working well enough to find the entrance to the Batcave. He descends the stairs, thinking that he has stumbled onto a Prohibition hide-out or some other long-held secret chamber. He is shocked hen he gets to the bottom of the stairs to find Man-Bat holding the limp body of the Batman. I apologize from the start for "spoiling" the mystery of who or what "the ghost" is in this story. For the careless reader who sees the cover illustration and doesn't realize that the object in the window behind Batman is one of Man-Bat's wings, the final pages *might* have come as a surprise. 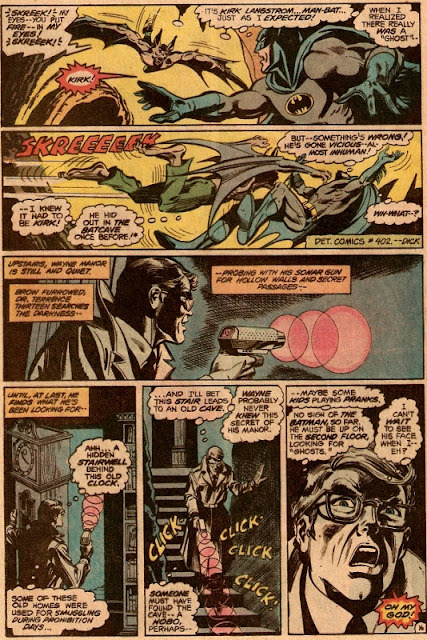 However, reviewing this story on a post devoted to Man-Bat....well, again, I'm sorry if you were not expecting to see something more mysterious as the "ghost." As a story, it sets up its mystery pretty well. Set in the DC Universe, I think "the ghost" really could have been a ghost, right? 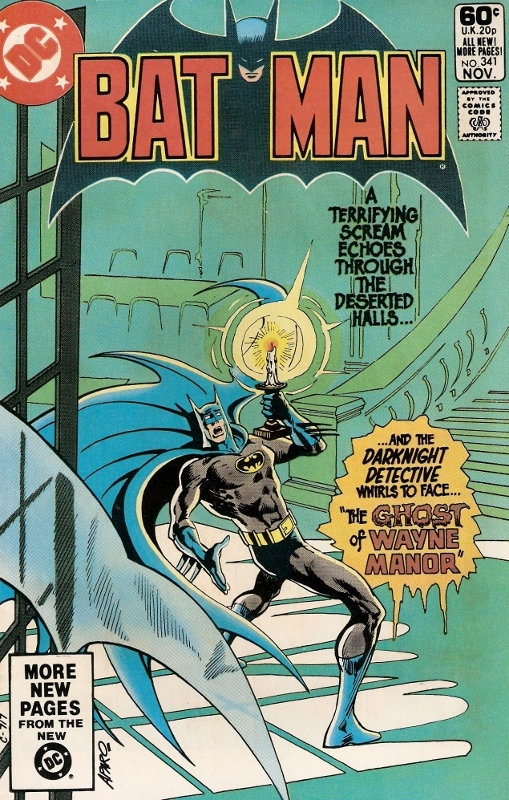 I mean, spoiler alert if you have never read the classic Englehart-Rogers Batman stories, but there is an actual ghost in that story arc! So Dr. Thirteen walking around saying, "There's no such thing as ghosts" sounds mildly ignorant. On the other hand, I can't describe how happy I was when I read the sound effect "Shreeeeek!" towards the end of the story. No other character makes that noise! So the story has set up that Man-Bat is living in the Batcave (appropriately). Now we need to come back next issue to find out the why and the how. 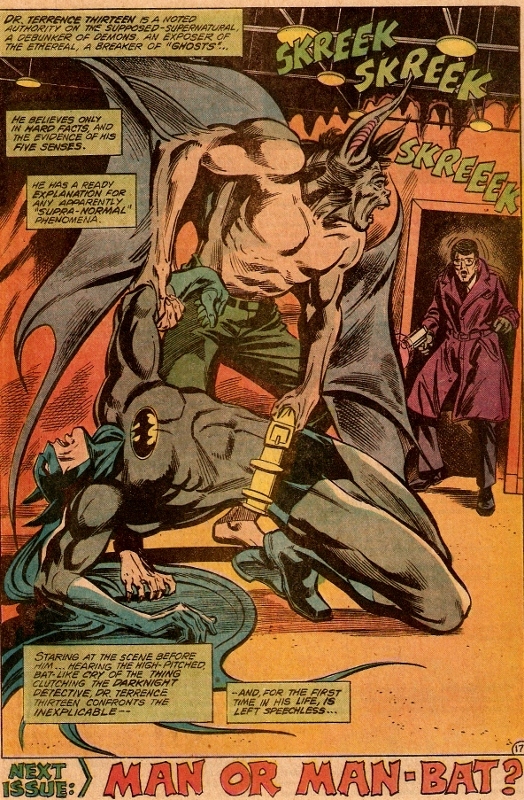 This is Man-Bat's return to the pages of Batman; he originally appeared as a guest-star in Batman #254. 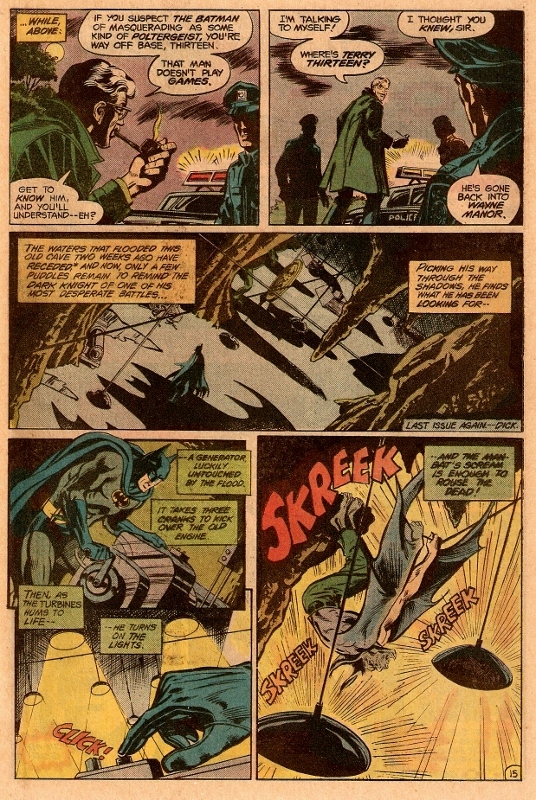 The artist of Man-Bat's first Batman appearance was none-other than Irv Novick, who also illustrated this story. Dr. Terence "Terry" Thirteen aka The Ghost Breaker made his debut in Star-Spangled Comics #122 in 1951. He was then a supporting character in Phantom Stranger (v2), and had his own series in Ghosts.